To determine the clinical significance of T2 signal hyperintensity in the proximal patellar tendon seen on MRI of the knee. 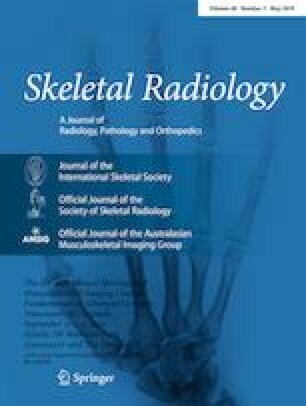 MRIs of 100 patients who underwent MRI of the knee between 1 May 2018 and 15 July 2018 were retrospectively evaluated. All examinations were performed on 3-Tesla MRI scanners with a dedicated knee coil and in accordance with our institution’s standard knee MRI protocol. The presence of increased T2 signal was assessed on both sagittal and axial T2-weighted fat-saturated images. The amount of increased signal in the proximal patellar tendon on T2-weighted images was characterized as: none, mild, moderate, or severe. A corresponding chart review of the referring physicians’ notes was performed to determine the presence of clinical symptoms of patellar tendinopathy. Patellar tendinopathy was considered present if the clinical notes described tenderness on palpation of the inferior patellar pole, infrapatellar tenderness, or patellar tendinosis/tendinitis. The majority (66%) of knee MRIs demonstrated the presence of increased T2 signal in the proximal patellar tendon. Only 4.5% of these patients had associated clinical findings of patellar tendinopathy. Although increased T2 signal in the proximal patellar tendon is a common finding, only in rare cases are there associated clinical symptoms. Thus, increased T2 signal in the proximal patellar tendon may not be a pathological finding in the absence of clinical findings of patellar tendinopathy. Lyndsey Burton's work on this paper was done while at UCLA Department of Radiology.